CLEANSE: When I'm flying, I often don't have access to a proper sink for 10+ hours. I've been bringing these cosrx one step moisture wipes with me while I travel. They double as a quick cleansing wipe and moisturizer in one! You can't get more refreshing than that. Tbh I use them at home too because they feel so good and are SO easy to use. When I have access to a sink I use my Foreo Luna Mini 2 to get a deeper cleanse. TONE: so I still haven't found a toner that's under 3 oz AND doesn't spill. 😂 In lieu of that, I use vichy's micellar water sample to refresh my face and remove any further debris or makeup. I keep my full size at home but this little 1 oz baby is perfect for getaways, even if it isn't technically a toner. EXFOLIATE: there's nothing like scrubbing off the grime that accumulates on your body when traveling! Volition Beauty's turmeric brightening polish is perfect for that! It comes in a squeeze tube and is spill-proof. I adore using this in hotels, especially when I'm experiencing jet lag... it makes me feel human again. 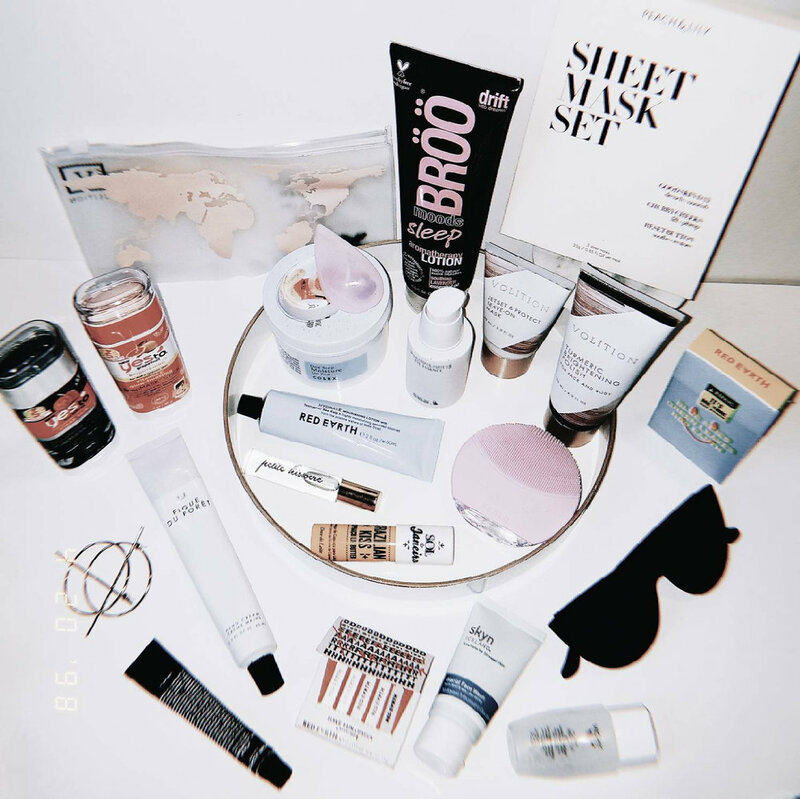 MASK: I always bring my Peach & Lily sheet masks with me to use in hotels, but I love using volition beauty's jet set and protect leave on mask for long airplane flights! It's completely invisible and inconspicuous but the perfect way to seal in moisture. I also use these Yes To masks because they come in a twist tube and only take 3-5 minutes to dry! MOISTURIZE: Red Earth's hydrate lotion comes in a metal tube and is perfect for on the go moisture! I follow up with @ecoyourskin's volufiline eye essence which is my HG eye cream and basically seals everything in. My @urbanoutfitters gourmand hand cream keeps my hands from getting dehydrated and @brooshampoo's aromatherapy lotion helps me fall sound asleep while jetlagged. It contains lavender and hops to calm the most frazzled of nervous systems. LIPS: Sol de Janeiro's brazilian kiss lip butter is a natural balm that is as moisturizing as it is delicious! I use my Grown Alcehmist vanilla & watermelon lip balm to layer over it. I also bring Red Earth lipstick matches for a touch of glam wherever I go. SCENT: most fragrances are not carry-on friendly but @becomealover perfumes are! They come in a handy roller bottle for easy reapplication, and won't bother sensitive noses right next to you! I find myself huffing these daily and can't imagine going 10+ hours without them! 😂 Thankfully I don't have to! Lastly these @makeupdrop applicators make sticky travel hands an issue of the past! Apply your products anywhere, any time! What are your travel essentials?